I saw this guy by the side of one of the shrine's paths. He's about three inches long. Tsubaki Grand Shrine is located at the foot of the mountains in a forest. There’s a stream running through with two waterfalls. The fields below the shrine are famous for the green tea that grows there. The creepy-crawly kind seems particularly prevalent. There are many species of large flies, wasps, moths, and I seem to be popular with all of them. There are mosquitoes, too, though I haven’t been bothered too much by them. Earlier this week, I saw what I’m pretty sure is a Japanese Rhinoceros Beetle. 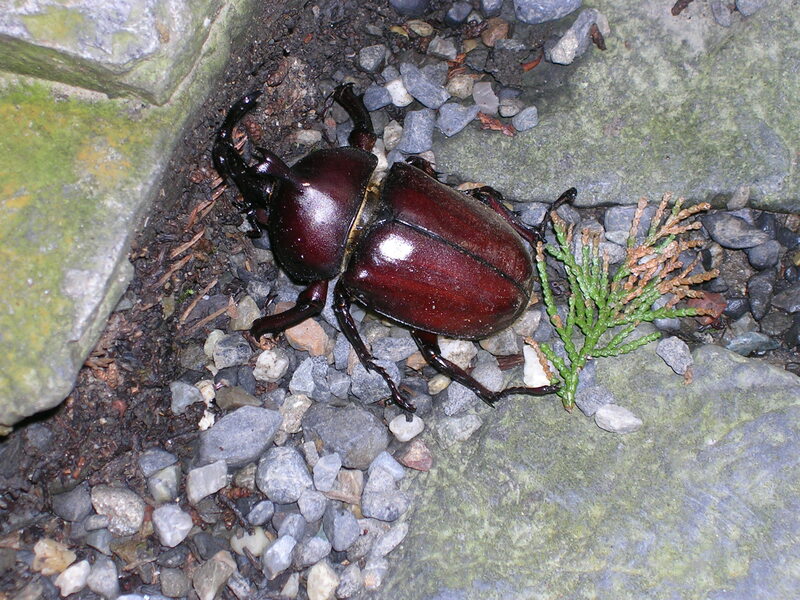 It was about three inches long, dark brown, and has a very prominent horn from which it gets its name. But there’s more than that. There are the sounds of birds in the trees. This place is alive. That’s why the shrine is here, where the earth meets the sky. It’s a special place. I was told that the shrine is the place where we are, not the buildings or any manmade thing. Most of the buildings here are only a few decades old, though they replaced much older structures. It’s the place that matters. 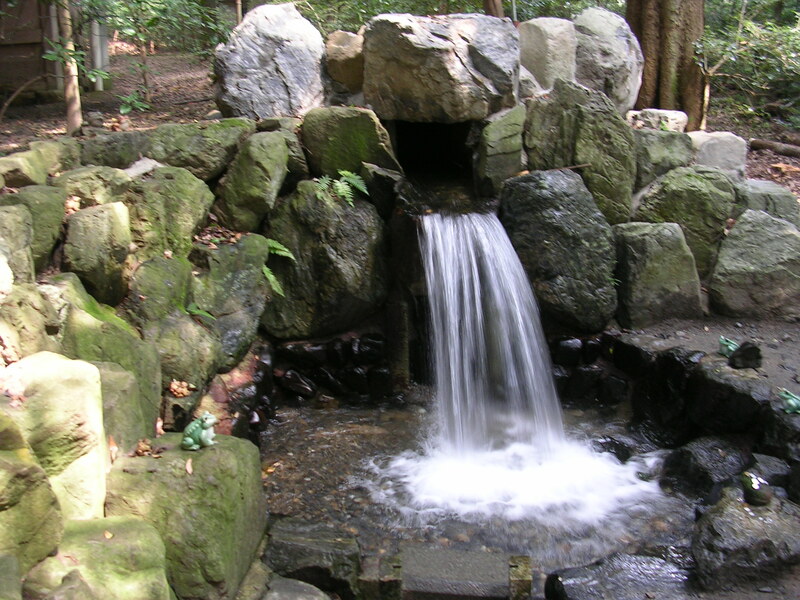 One of the two waterfalls at Tsubaki Grand Shrine. And there’s the water. Every time I come around the corner from the archery field towards the shrine of Ame-no-Uzume-no-mikoto, who is the wife of the shrine’s main kami, I hear a rumbling. It sounds like a rainshower is starting, which does happen here about three times a day. But it’s actually the sound of the waterfall. The water here is alive. It runs through the stream and the stone gutters, clear and fast and loud. The trees are amazing, too. 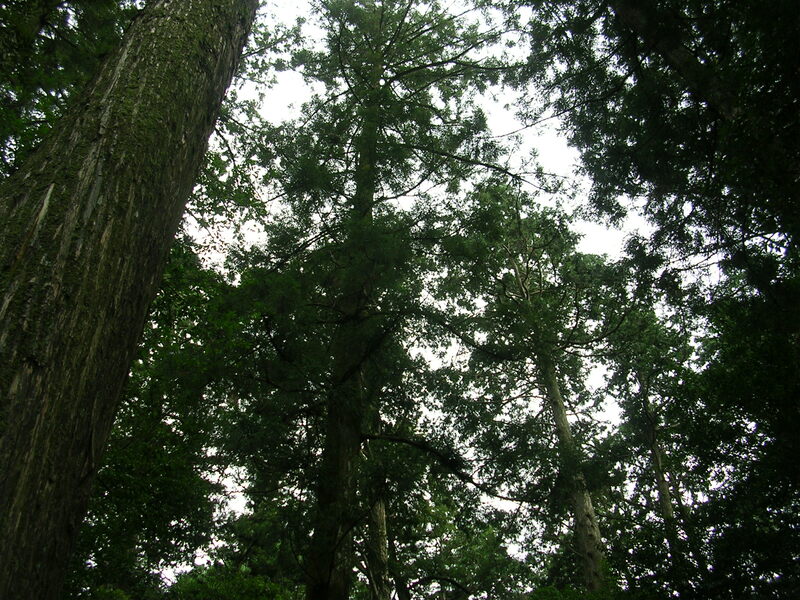 The cedars (I think that’s what they are – one of the priests said I was right when I asked him that) are huge. The largest ones are well over a hundred feet tall and probably more than 10 feet around. They are several hundred years old, the priests tell me. The other trees are beautiful too: camellias (Tsubaki means camellia in Japanese), the maples which turn bright red in autumn, the sakaki, an evergreen native to Japan whose branches are used in ceremonies. This place is very alive, something that’s obvious even when you’re inside. The shrine buildings are mostly open to the outside, which is a little uncomfortable with the hot, humid weather (and I imagine winter isn’t much fun, either). But it does remind you constantly that this is a living place. The trees are huge here, some of them rising more than 100 feet. Life is everywhere. That’s one thing I’ll take away from this place.